We love games in our home. Seriously addicted would be more like it, because we have game night every. single. night. Whether it’s all three of us or just my husband and I, we play board games a LOT. I recently heard of Spin Master Quick Cups and think it would be a perfect game for my family. Check out the amazing new Quick Cups video from Spin Master and enter the giveaway for a chance to win 1 of 3 grand games packages including Fibber, Moustache Smash, Boom Boom Balloon, Shark Mania, Rapidoodle, and Quick Cups! We are so competitive that trust me when I say that if my son wins, it truly is because he won. I do not let him win. I don’t let anyone just win. It’s how I roll. You can subscribe to the Spin Master YouTube Channel, too. 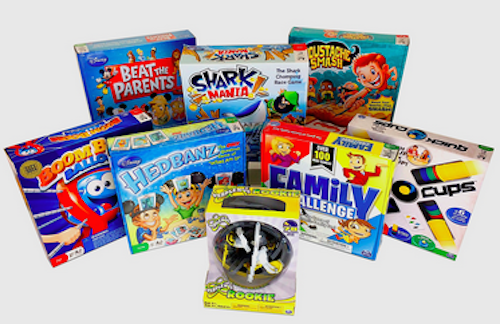 Enter on the Rafflecopter form below for a chance to WIN one of three Amazing Game Packages worth over $125 from Spin Master Games! OR 10 Runner Ups WIN the NEW Quick Cups Board Game! Good luck! Thanks again to my dear friend and wonderful photographer, Mary! I seen it on a blog by donna fb post. The kids and I like playing the shark mania game. We play the Shark Mania game on family game night but the Disney Beat the Parents or the Heads Up games look interesting. I found this giveaway in your email. I like Beat the Parents. I think my family would like the LOGO PARTY game. Looks like it could be fun. We’ve played Beat the Parents and it’s really fun 🙂 I’d like to play quick cups. I like the Mustache game. The Quick Cups video was neat. I have not heard of this game before. It looks like fun! I heard about the Spin Master giveaway on Blogs by Donna and my favorite game is Shark Mania! I found this giveaway in a Blog by Donna email & i don’t know that i’ve ever played any of the Spin Master games but Battle of the Sexes looks like it’d be fun. Someone shared it on my newsfeed! And I’m Clair Freebie on YouTube…forgot to leave it on the Rafflecopter entry. I found it because someone shared it on my newsfeed! Clair Freebie on Youtube cause I forgot to leave it on the RC! My kids would love this! Especially because we are usually stuck inside during the winter and we love to play games as a family. I WOULD LOVE SHARK MANIA AND SPIN. THIS WOULD BE GREAT FOR ME TO PLAY WITH MY KIDS ON A SNOW DAY. I found this on Blog by Donna, and I would love to play Beat The Parents with my child and my husband!